If you have read my previous post (sorry I've taken it down for the time being), then you will know that I've been having a bit of a hard time lately, so when I was contacted to see if I would be interested in treating myself to a relaxing day it could not have been better timing. I was kindly gifted some money to spend however I wanted, in a way which would help to take the stress out of every day life. To me, relaxing doesn't necessarily mean doing nothing or going for a massage... just a day of doing something I really enjoy is relaxing enough for me so I decided to spend the day in my favourite city; Newcastle with my boyfriend. We drove up after dropping Elodie at school and had a little bit of a shop (I spent most of the time in Fenwicks Beauty Hall), before going for a stroll along the Quayside, it was freezing but I love it there so much, I really didn't care! 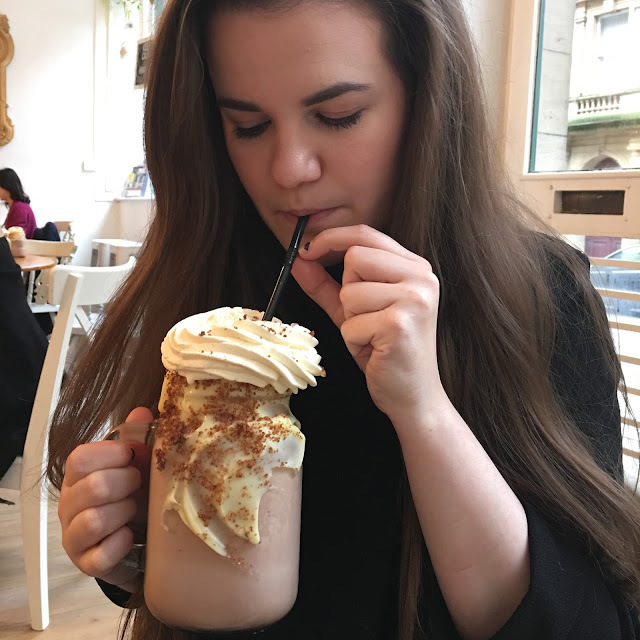 Then we came across a place which I have wanted to visit for ages, ever since seeing a picture of one of their giant milkshakes on Charissa's Instagram, so of course we had to go in! The Great British Cupcakery is as cute as it's name sounds; a vintage style bakehouse and parlour, with shabby chic furniture and floral decorations situated almost directly under the Tyne Bridge and set just back from the Quayside. Run by a team of two daughters and their mum, with bakes inspired by their grandmother, there are just so many delicious treats to choose from. Upon entering the cupcakery you are instantly drawn to the counter, filled with endless flavours of cupcakes and adorned with beautiful layer cakes, sweet treats and freshly baked scones. I knew I was going to have to try one of the milkshakes known as the 'Geet Big Shakes', and Robbie was instantly drawn to the huge scones, so ordered a cream tea. My shake was chocolate flavour, with cream, cookie sprinkles and creme patisserie topped with a cookie ice cream sandwich... it's fair to say this was the best milkshake I've ever had, but be warned that if you're going to have one of these, they're massively filling! I had planned on ordering one of the huge crispy cake bars or a chocolate and raspberry scone afterwards (how good do they sound?! ), but there was no way I could have managed it... Still it's a good excuse to return! Robbie's scone (which I pinched a bit of), was huge and absolutely delicious, even he didn't manage to finish it off but he did comment that it was one of the best he'd ever eaten. You can also head to the Great British Cupcakery for afternoon tea (if you book) and you can order bespoke cakes - just check out their website for more info. If you don't have so much of a sweet tooth, they also serve amazing looking sandwiches and breakfasts. Although I left Newcastle feeling rather full and bloated, I had the loveliest day and I can't wait to go back to try more from the GBC menu! Thank you so much to Ocean Loans for treating me and allowing me a day to relax. Oh I would love to be eating that right now!! The milkshake are amazing aren't they, the decorations are so inventive! I've tried the cookie dough milkshake and want to try the hot chocolate next which looks just as amazing. I bought afternoon tea vouchers for my mam and gran at Christmas so we're looking forward to going there soon. THAT is a milkshake, omggg. I LOVE the Great British Cupcakery and work just round the corner so I have to kinda forget it's there, otherwise I'd be in there every lunch time and then I'd the size of a house. I think I've probably tried every single one of the cakes but am yet to indulge in a Geet Big Milkshake, even though I've thought about it a lot. Next time I'm going for it! I had afternoon tea there for my hen afternoon and it was amazing! Every time I walk past I get really jealous of people drinking those milkshakes, they look incredible!